Therapro catalog offers innovative products for occupational therapists, speech therapists, physical therapists, educators, and parents. Use the coupon code to save money on all your developmental product purchases, too. Your discount will be automatically applied at checkout on the Therapro website. Therapro's goal is to provide unique speech and occupational therapy supplies that help to revolutionize the way occupational therapists, educators, and parents provide preventive, developmental, and rehabilitative care. With the right tools, developing gross motor skills, fine motor skills and communication skills is less frustrating for the patient. Therapro has assembled a collection of occupational therapy products that simplify teaching and learning, resulting in a better outcome in a shorter period of time. 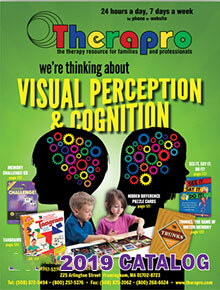 Therapro hasn't forgotten educators. They offer special education teacher resources, and occupational therapy products designed for use in the preschool or grade school classroom. Choose the children's special needs equipment that addresses the specific deficiencies present in your classroom. From teaching children how to develop and improve fine motor skills to providing support for the hearing impaired student, Therapro is at your side with the products and supplies that special education teachers need everyday.